Ok i have a cheery shrimp tank with 9 females with eggs. Now I noticed lastnight that the 1 of the female dropping eggs. That got me to thanking. I've had females with eggs before and never notice any lerva swimming like I did with my ghost shrimp. now questions. 1. Do cherry shrimp eggs not go throw this lerva stage? 2. Will having MTS (Malasian trumpet snails) eat the eggs? 3. 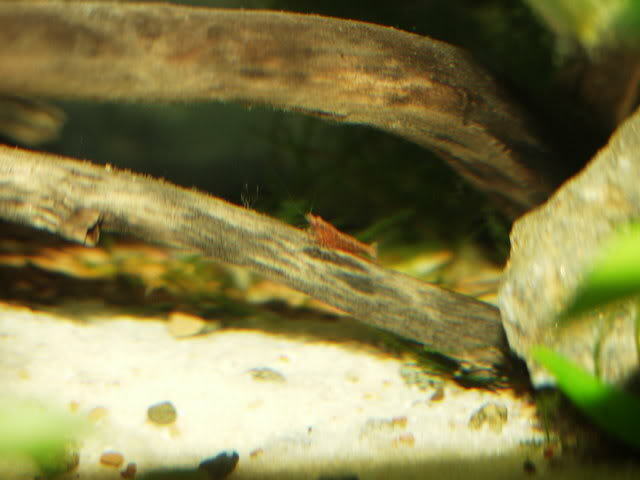 Are the little clear looking shrimp the babys or just males? Any sites that talk about or shows baby cherry shrimp mit help, I mean I've never had any trouble with them health or breeding just never see any lerva (spelling not sure ) from the females eggs. The population looks like it's the same size as it was when I frist got them 4m ago. Just never noticed a female just droping eggs. Normal or not? Female RCS will carry the eggs untill they hatch, or she will "drop" them if they are infertile. 1.) RCS shrimplets do not go through a larval stage, they are the exact same as they will be as adults, just little miniatures of them. 2.) I don't beleive MTS would be a bad thing for them, I have some MTS in with my small RCS (about 1/8 inch) and haven't lost them yet. Thanks. I finally seen some of the babys yesterday. They looked just like the adults,but very very small. LOL How long does the female carrie the eggs before she drops them? Female RCS can drop their eggs at any time, dropping them means that they are infertile or she can't take care of them. Though when she does carry them through untill they hatch, they usually hatch in 2-3 weeks. I just wanted more input on this topic. Today I was wiping diatoms off of my glass(seems worse since I have more light). Anyway I bumped my driftwood and then noticed my largest Endler(male) had a sack of eggs that he was eating, he swam around for awhile w/ it, and was having a hard time eating it, had to spit it out, then peck at it, then dropped it and a small endler was pecking at it. So the eggs were greenish color, did not look like the other clear egg sack I've seen that I assumed was snail eggs(came with plants). Most pics of RCS eggs/larva/shrimplets I've seen are yellow, except for in this link(3rd pic down). So I believe that a shrimp dropped her eggs. Is this what I saw? Since I've only had these RCS for a couple weeks, I think it is not a big issue unless they continue to do it. The shrimp molt regularly, and I have males and females, including many females that seem saddled(yellow), but I have not seen any eggs except for these so far. EDIT:I just saw more eggs dangling from a RCS, then it came out in the open more and it was indeed RCS eggs being droped, like 30+ eggs. Sometimes you hear of a relatively immature female (say on her 1st time with eggs) simply not being able to hold them and so losing them at some point. Females occasionally dropping eggs is nothing to worry about, it could be what I said or any number of other factors. 1. There is something in the water parameters that is not good; a small ammonia spike, an unexpected swing in pH, or borderline too-high nitrates are just examples of things that can cause a female to drop otherwise healthy, fertilized eggs. 2. There is something else in the tank that is (at least occasionally) harassing the pregnant females. If, say, one of the endlers took a little too much interest and was nipping at one of the females, I could very easily see her dropping the eggs in response. I would also like to put it out there, endlers livebearers have a joy of picking the eggs off of shrimp, a friend of mine only got 3 babies out of all her RCS when they were in a tank with endlers in a 4 month span, sold the endlers off and now has a nice colony going. I did notice today that another RCS had eggs, they looked more yellow to me(kind of hard to see through the body and the eggs were small), so I'm hoping they are valid. As the ones that were dropped were greenish and assume not valid. Also does anyone know how often they can have eggs? I know its 2-3 weeks for the eggs to mature, is it basically monthly birth? Actually, the color of the eggs holds little significance. Usually whatever color their "saddle" is will be the color of the eggs, all my RCS carry green eggs, I think it is in genetics. I have seen yellow eggs being dropped before when I had some females with yellow saddles (right after getting them). They'll breed as soon as she has released the shrimplets but getting around to it can take a while. A male has to find her first and that can be difficult in a planted tank IME. A month is a good estimate, might be longer or shorter. Dropping eggs is stress, not infertility, as JohnPaul alluded to. The eggs are fertile when they are being held - they are fertilized while in the saddle, not while being held. Endlers are wicked about hunting/harassing cherry shrimp. Tried it, tons of moss in a 30 long.... I ended up with female endlers playing bombardier, they'd go head first in a dive to go at shrimp into the moss.